WASHINGTON/SEOUL, Nov. 27 (Yonhap) — North Korean leader Kim Jong-un has expressed a willingness to allow inspectors into the country’s main nuclear complex, a senior diplomatic source said Tuesday, citing a message sent to U.S. President Donald Trump. Kim earlier expressed a willingness to permanently shut down the site in Yongbyon if the U.S. took “corresponding” measures, but his apparent offer to allow verification has not been reported. If true, Kim’s offer would mark a significant step toward meeting U.S. demands for full and verified denuclearization, a position Washington has stuck to since a historic Trump-Kim summit in June. 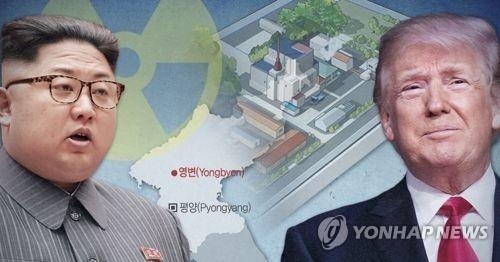 “I understand that Chairman Kim told (South Korean) President Moon (Jae-in) during their summit in September that if the U.S. took corresponding steps he would not only be willing to shut down the Yongbyon nuclear facilities but also allow verification,” the source with knowledge of U.S.-North Korea negotiations told Yonhap. A planned meeting between U.S. Secretary of State Mike Pompeo and a senior North Korean official was abruptly postponed earlier this month with no further announcements of a future meeting despite Trump’s intentions to hold a second summit with Kim early next year.